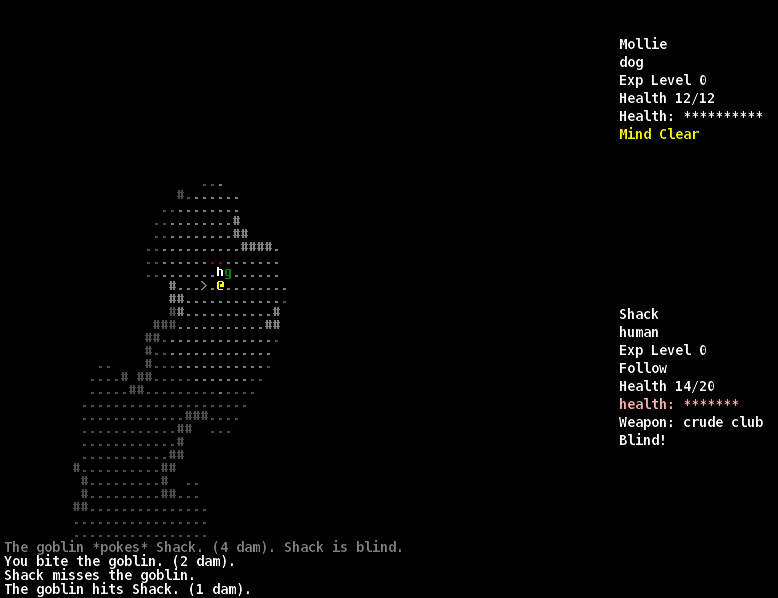 I didn't take part in the 7 Day RogueLike challenge this year - but I decided to play as many of the completed games as I can and review them here. I really appreciated that people took the time to write about my game last year. My top three recommendations come first, the rest are in no particular order. 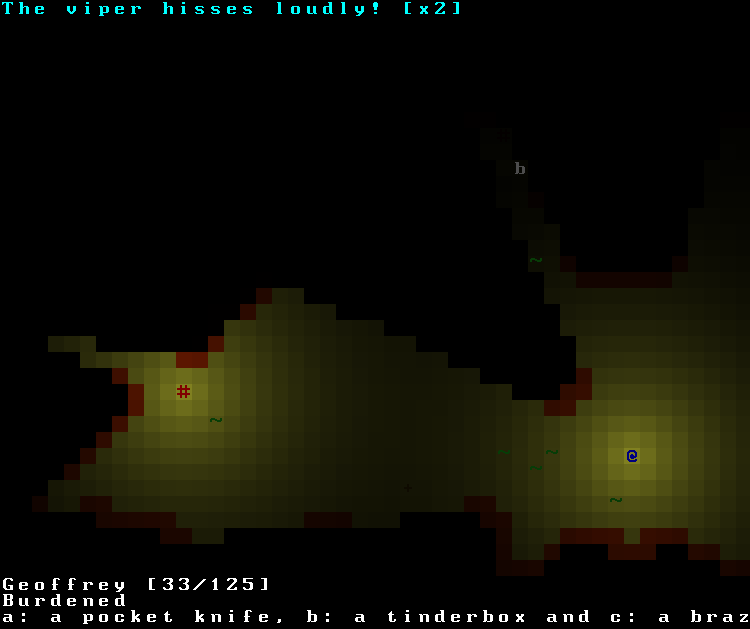 Vicious Orcs is this years entry by 7 day roguelike veteran Jeff Lait. It's built on the same slick engine as Smart Kobold, though I still get confused by the overlapping level design in both games. The game itself is well designed, with a simple but effective story. You begin weak, and have to pay the village healers extortionate prices whenever you get hurt. If you have enough money you can also get broken equipment that you find repaired. However the game really changes pace when you start to discover magic spells, each of which has a profound effect on this pattern of play. The ending is clever and made me think. Overall it seems Jeff has taken a break from his pattern of highly original roguelikes, instead choosing to apply his accumulated knowledge and focus on making this year's entry as fun as possible. In my opinion, he has succeeded. 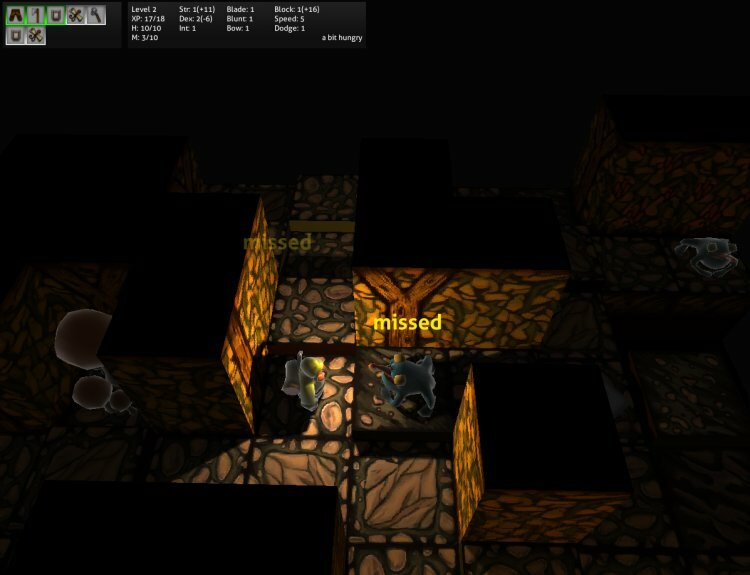 Rook is a short roguelike where you attempt to traverse one level to kill the king at the far end. It has nice scenery and a visibility system which makes things like the windows in houses meaningful. The thing that really makes this game special is that you can't die - the game prevents you from making any move that leads to immediate death (even if you have no way of knowing that's the case - due to chance or a danger you haven't seen yet). 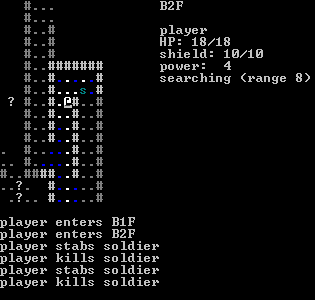 Gameplay varies between a traditional roguelike and a puzzle where you're planning each move carefully. Overall I found it to be a good little challenge. 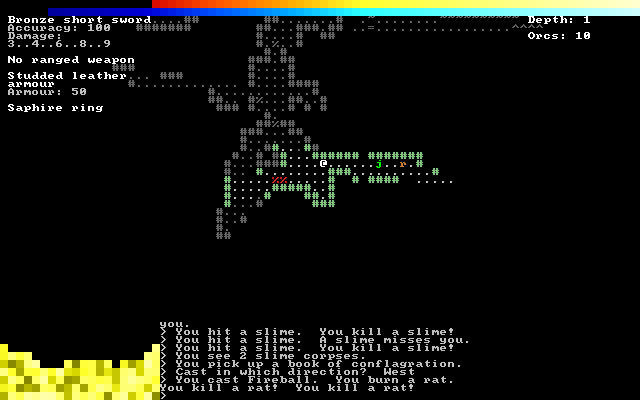 Kusemono is a stealth roguelike, in which you sneak up on mutant ants and stab them in the back. This is accomplished by getting close without lining them up in cardinal or diagonal directions - then switch to running and close in for the kill. The mechanic is tricky at first, but very satisfying when you learn to pull it off. I enjoyed playing, but was almost put off by the difficulty. This game punishes you when you make a mistake, and you should expect to die frequently at first ... especially if you don't read the README. God of Change would be an ordinary roguelike, were it not for the mad dungeon god who keeps giving the monsters new abilities as you play. This innovative mechanic added variety and challenge - although sometimes the rate of change was overwhelming. I enjoyed collecting wands as they made me feel like I had found a much needed edge over my foes. I would prefer if diagonal movement was allowed, and if the game window behaved a bit better. 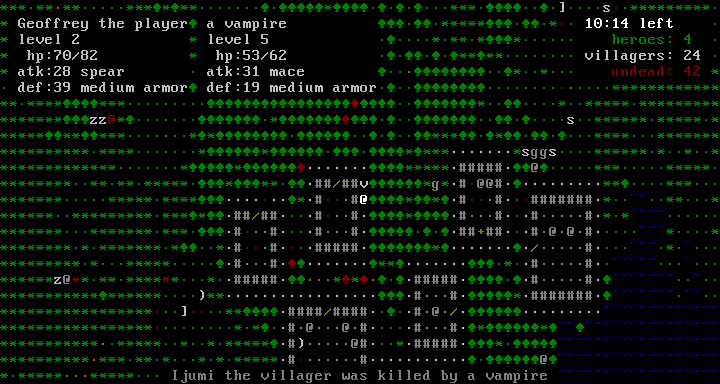 In Twelve Hours you play as a hero who must survive / protect a village from a twelve hour undead assault. The village has a few other heroes, controlled by AI, who help you to do this. I played the game online, and found it easy to get into with a clear and helpful interface. The detail of the setting drew me in, as did the AI which appeared to be reasonably sophisticated. Combat was straightforward. However the game was let down by technical difficulties - I experienced two crashes, and numerous times the game slowed down badly when there were lots of monsters about. 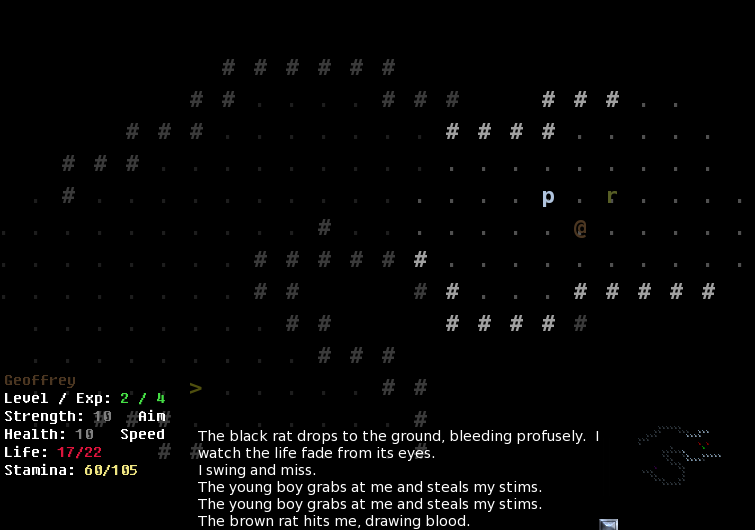 The Man in the Mirror is an incredibly polished 7 day roguelike. You play as a mental patient who skips between the real world and the world of his own mind. The transitions between these worlds are handled really well, the setting is excellent and the story is engaging. Gameplay is straightforward, but I found it frustratingly difficult for a story based game. 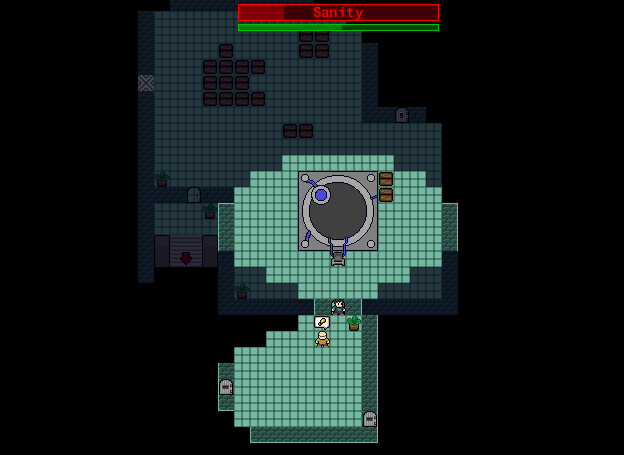 Broken Bottle has you playing an alcoholic in a dungeon, trying to reach the surface. Deciding when to use alcohol is supposed to be a core element of the game, but I found I didn't need to touch it until the later levels. The game also includes a variety of equipment and a system for improving stats when you level up. It's also pretty well polished, no doubt in part because it's built on T-Engine. In Inversion Of Control you can switch control between an adventurer and his pet cat or dog. I enjoyed Dungeon Minder, a game with a similar premise, and I really wanted this game to be as good. 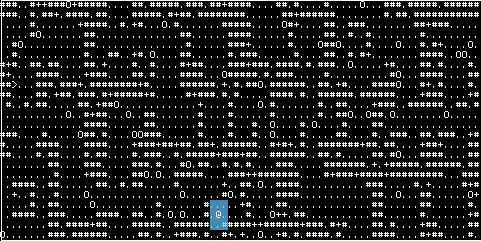 I found it to be less strategic, and though it's charming in places it's also rather buggy. Version 3 is a noticeable improvement, and there have been more fixes since. Elite International Detective is a stylish game in which you persue criminals across the world. It's an original idea and the theming is excellent. The controls are a bit awkward and gameplay does get repetitive, but I think it's still worth a look. The first thing I noticed about Pitman Krumb is the graphics. It's 3D, it looks good and it's nicely animated. 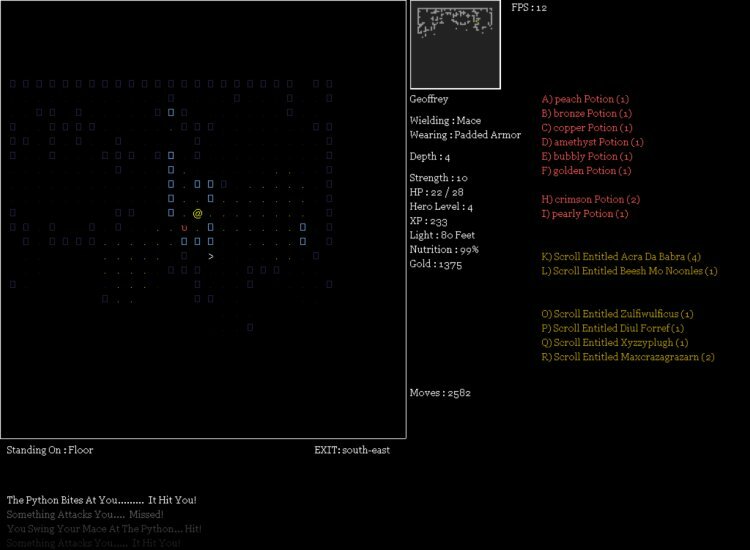 The gameplay is definitely roguelike, though slightly non-traditional as you use the mouse to move several tiles each turn. This works well enough. The game has quite a range of items, sadly let down by a fiddly inventory system. Other than that it kept me amused for a while, though I was never really sure what the goal was. My favourite bit was being told a monster had destroyed my trousers! I couldn't get very far through Light, because the Windows version crashed frequently, and I couldn't persuade the Linux version to run at all. Also some of the levels didn't seem to have an exit. What I did see was promising, it evoked the feeling of being in a cave full of creepy crawlies, worrying about my fading light and dwindling health. Destiny of Heroes is a fairly traditional roguelike, featuring a dungeon full of monsters and a lot of potions and scrolls to identify. It's biggest strength is probably the dungeon generator, which creates a wide variety of levels full of interesting features and monsters. My one complaint is that the game becomes sluggish after I've been on the same level for a while. Apart from that it's quite polished, and even features a mini map. In Monster Slayer Show, you fight monsters in an arena, trying to rack up points through spectacular kills in front of the crowds. This is a cool concept, and it's has some pretty cool weapons in it. It would be nice if it was easier to achieve the big multi-kills that the game is all about. 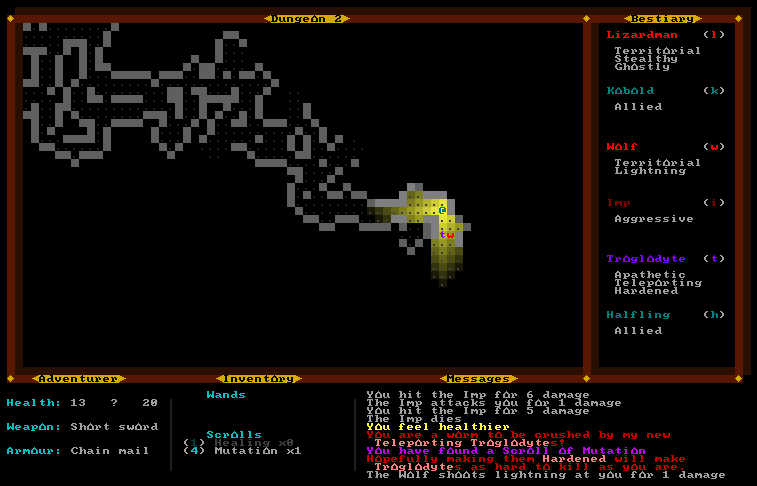 I was drawn to Magicko because it sounded a bit like Harmless, a 7DRL I enjoyed last year. In this game you have access to 10 elements which you can combine to produce many different spell effects. Finding it a bit much, I decided to focus on just a few elements to begin with. I chose healing, arcane and earth and was soon blasting bolts of rocky death and curing myself when I got hurt. Having mastered that I began to dabble with fire and cold as well. This was quite a lot of fun. I can't help but feel the game would be better if it had some kind of unlocking system, rather than giving you all 10 elements up front, and it would definitely benefit from more intuitive controls. 7DRLCC is a nice idea - complete the level before the time runs out. Yes, that's real time ticking away, not a turn limit. Gameplay is rather frantic, it's essential that you spot the stairs as quickly as possible and get running. It could do with a bigger game window and more content. Also, some of the levels it generates are impossible. You will need to install Love to play this game.